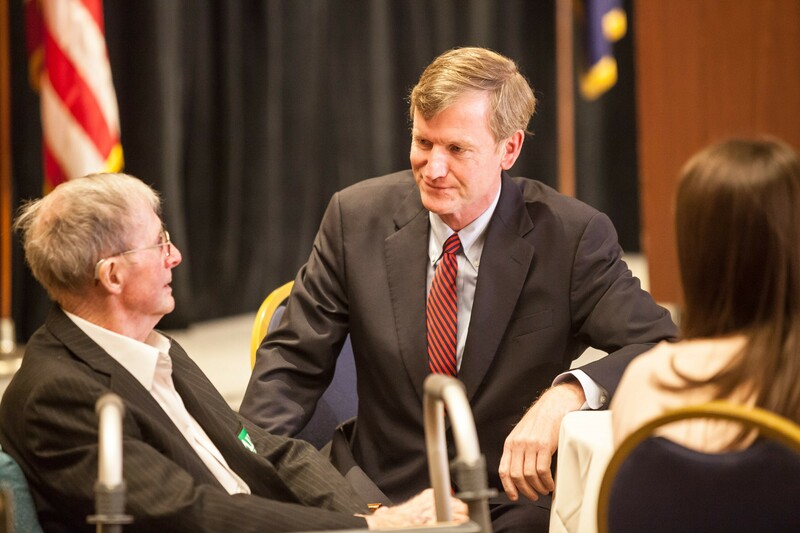 Scott Milne with his father, Donald, on election night. Updated at 1:56 p.m. with more from Scott Milne. A month after his second-place finish in Vermont's gubernatorial campaign, Republican Scott Milne has again delayed his decision to contest the election in front of the legislature. But the Pomfret businessman now says he’s “leaning” toward staying in the race until January. “All options are on the table, but I’m leaning toward staying in,” Milne said Thursday afternoon. Since no candidate won 50 percent of the vote, Vermont's constitution calls on the legislature to pick a governor from among the top three vote-getters. Typically, those who fail to win a plurality concede the race shortly after the election, but Milne says he may ask legislators to vote him in, despite the fact that he came in 2,434 votes short of Democratic Gov. Peter Shumlin. The day after the election, Milne scheduled and then canceled a press conference to announce his intentions. A week later, he said he would not seek a recount, but would take a week to decide whether to actively contest the race before the legislature. When that deadline passed, he said he would deliberate over the Thanksgiving holiday and announce his intentions this week. On Thursday morning, he told Seven Days by text message that the announcement was "sliding into next week." Milne declined to say how he would convince legislators to vote for the second-place vote getter, nor would he speculate about his odds of winning. “You’ll probably have a better feel the first week of January,” he said.